Adjustment procedure for setting the correct ignition timing. 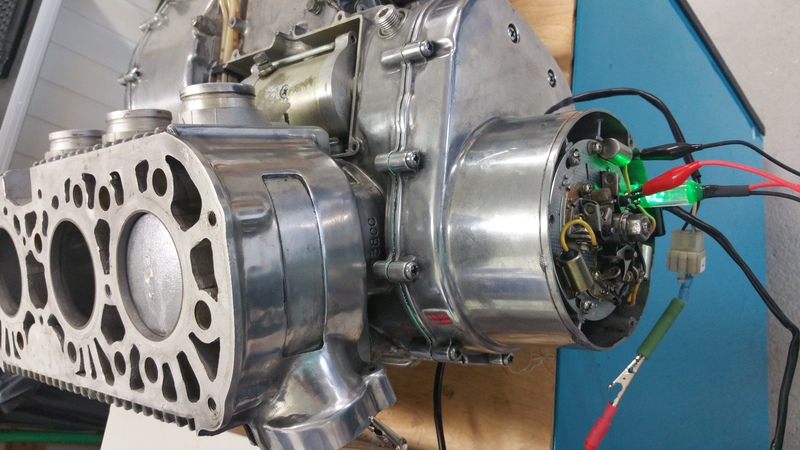 Please read previous post regarding the functional description about the GT750 ignition system. This post will cover the adjustment of the points to achieve the correct timing. In fig.1 you can see the Timing Plate showing the BTDC marker for each piston. 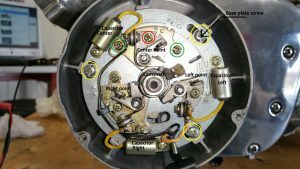 When the marker is aligned with the black arrow at the bottom of the picture the piston is 24 deg befor the TDC (Top Dead Center ) or 3,64 mm below the top. 3,64mm for L and R and 3,42mm for C piston. This timing plate was the Suzuki original idea regarding the timing adjustments and no other equipments than a lamp was needed for doing the job. Quite simple. The points should open when the markers are aligned. Clamp on the Contact Point base plate with all its assembly and do the adjustment. Some guidance can be needed. 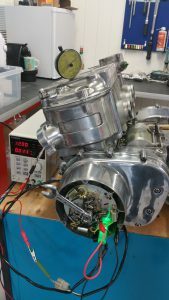 Suzuki understood after a while, the procedure using the timing plate was not accurate enough. Some extra tools can also be handy for an optimized adjustment. The Dial Gauge will be used to give a accurate measurement from the TDC down to the position where the points should open up (BTDC). I made my own instrument using a standard dial gauge and drilled a hole in a spark plug for mounting the gauge. The lamp is also self made. 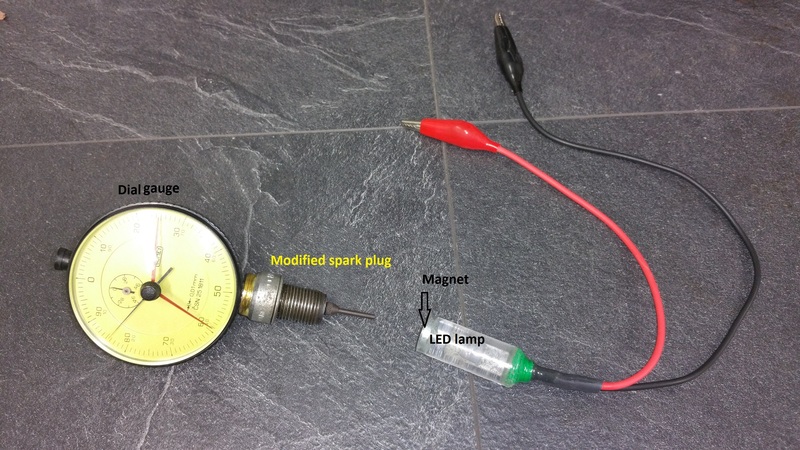 A LED lamp with a magnet at the end for easy fastening on top of a screw or other parts which are magnetic. If this is not correct, move the crank until the markers are aligned and loosen all of the three base plate screws and move the plate until the lamp goes on and off. Secure the screws. Now you are back to the original state before dismounting the timing assembly. Center and right points should also be OK at this stage if they were correct before the dismounting. Rotate the crank until you have the maximum distance between the points. Measure and verify the gap. Should be between 0,3-0,4mm. If adjustment is needed, loosen the screw with a red label in fig.3. Check this for all of the three circuit breakers. Do this before the final timing adjustment. Any adjustment of the gap will also influence the timing and the timing has to be rechecked. As mentioned before, Suzuki recommend not to use the timing plate as the final adjustment. A dial gauge is needed to get this correct. There are different type of dial gauges on the market. Suzuki has a special one with a zero function. I use a standard type but capable to measure several mm. Whatever procedure you decide to use, this is important : Don’t count mm while rotating backwards. 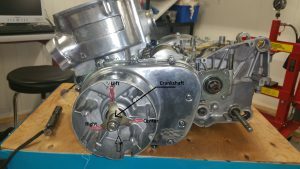 From the BTDC rotate the crank the normal direction (counter clockwise). The distance from BTDC to TDC is 3,64mm for the left and right pistons and 3,42mm for the center piston. The procedure above is not compliant with the procedure in the Suzuki service manual, page 94. 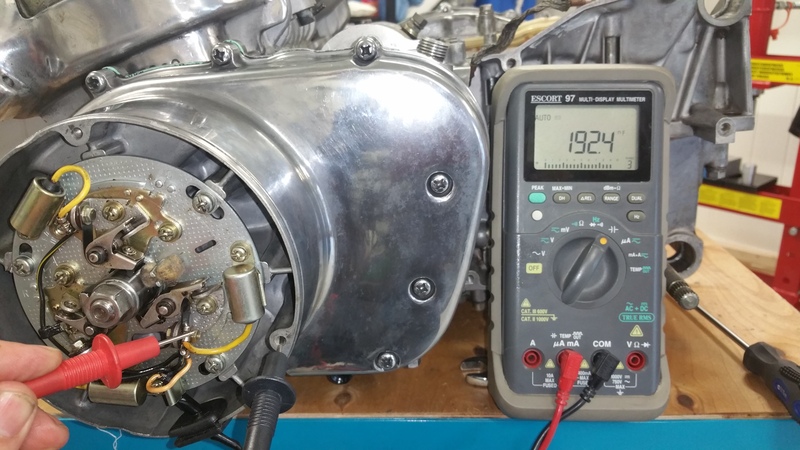 Suzuki use a battery driven lamp / buzzer to measure the points. The leads out of such a device gives light / sound when you short the leads. 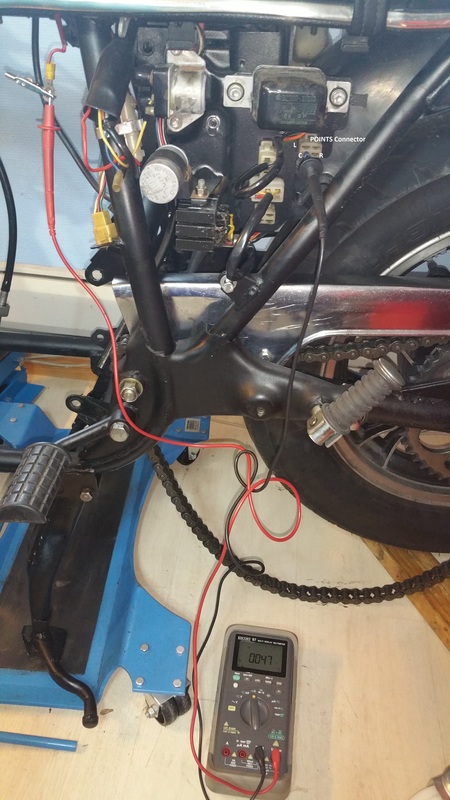 The points does this short and the lamp will therefore go out when the points open up and will light when the points are closed, exact the oposite function of a test lamp using the voltage from the battery on the bike. One more time, opposite light function compared to my description above. If you didn’t get this, read it one more time and give it a try on the bike. In this post I will try to give basic information about the electronics in the ignition system. 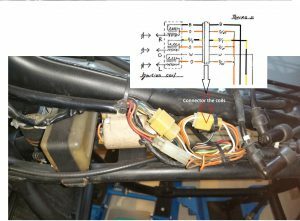 The Suzuki service manual refer to two of the key components as Condenser and Coil. In fact , that’s a bit wrong. The condenser is a capasitor and the coil is a transformer made of two coils, one for the primary side and one for the secondary side. 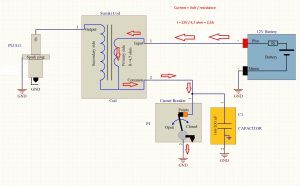 The word condenser is common to use on components able to store or convert energi (ex:converting gas into liquid) but in electronics this device is more referred as a capacitor and I will use the word capacitor or CAP in the rest of my posts. In fig 1 you can see three caps connected above each circuit breaker to protect the points in the breaker. One for each cylinder , Left, Centre and Right. In fig 2. you can see the electrical connections of the capacitor. 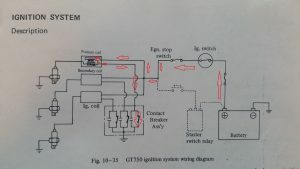 There is only one wire connected, the yellow wire as shown in fig.1. Pin2 in the schematic symbol is internally connected to the body of the component and will therefore be grounded when mounted at the assembly plate. The schematics in fig.2 is only for one cyllinder. All together we have three coils, three circuit breakers and three capacitors, but one battery. A capacitor consist of two metal plates (metal foil) with an electric insulated material in between. The Suzuki type is rolled and put in a can. That’s the reason for the shape of the cap. If you apply voltage to a cap you will charge up the cap with current until it has the same voltage as you apply. Almost the same as a battery except from the speed. You can charge and discharge thousends of times within a second. The frequency can be many kHz. If we go above Mhz the performance will change and this type of cacitor will become a coil, but don’t worry, I will not discuss that now. The units for measuring a cap is Farad. The value of the Suzuki cap should be in the range of 160-220 nF. That’s the same as 0,000000160-200 Farad. Make sure the point is open and not closed. If the point is closed you have a short in paralell of the cap. 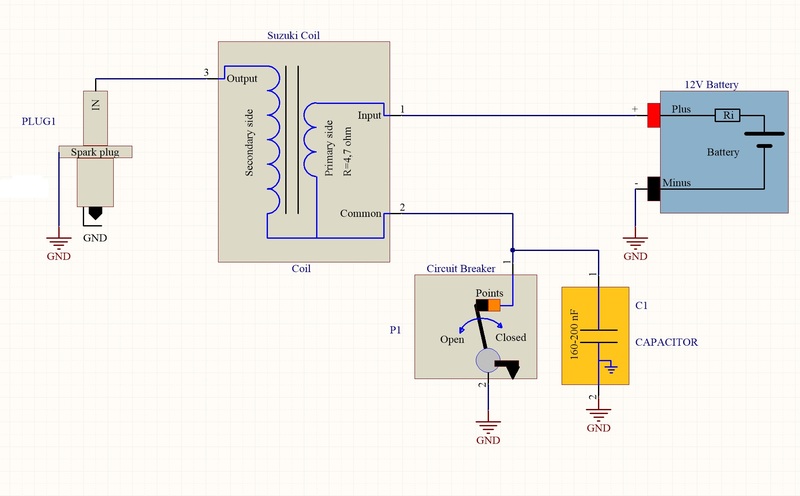 Use an instrument capable of measuring CAPACITOR. Connect the red test lead from the CAP output to the yellow wire on the capacitor. The black lead to any part at ground level. In fig. 4 the value is 192 nF and is a valid result. 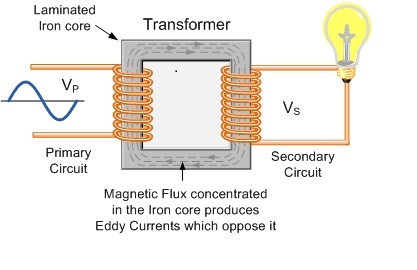 As mentioned in the beginning of this post the Suzuki coil is actually an electromangnetic transformer and contains two coils. And three of those transformers is needed, one for each spark plug. What is a the function of an electromagnetic transformer ? And don’t be sad if you don’t understand why. Einstein didn’t understand it either. No one does, it’s only a fact of physics. And it only happen if we apply AC (alternated voltage) giving an alternated magnetic field. A static magnetic field does not induct any voltage at the secondary side. In other words, a 12V DC battery gives no voltage at the secondary side. Stop !, that’s what we have in the GT750 electronics, a DC battery and a transformer. 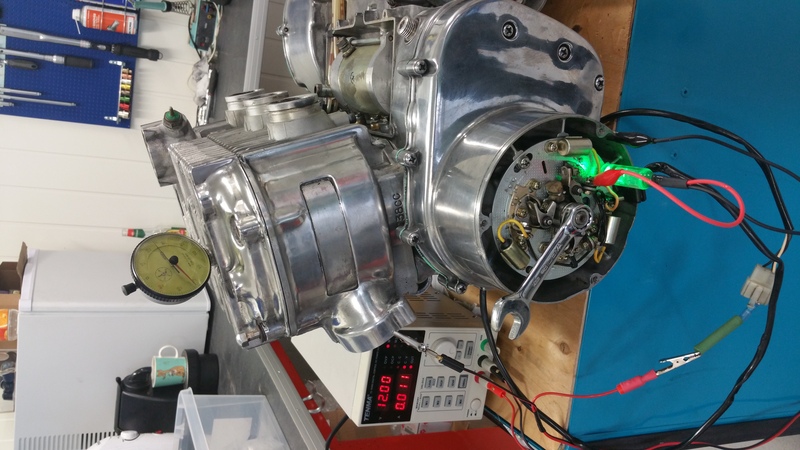 Yes, and you don’t get any voltage on the secondary side until you…..cut off the current with the circuit breakers. 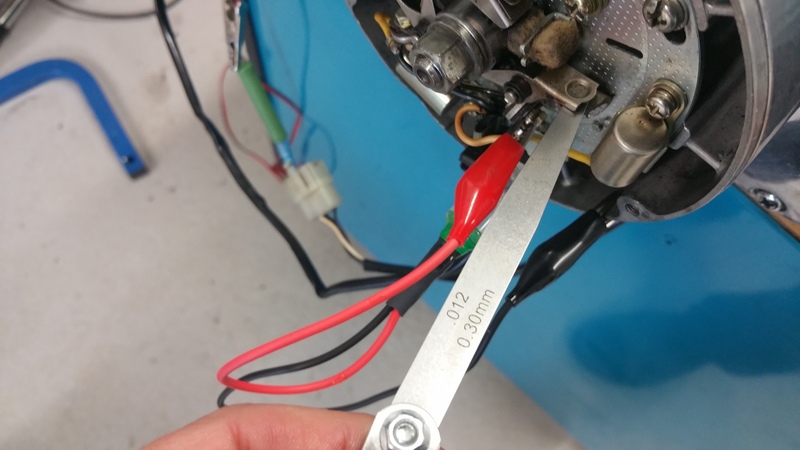 That’s what we use the points for, cutting a DC current into pieces , making a conversion from DC to AC. I measured the DC resistance in the primary side coil to about 4,7 ohm. 12V divided on 4,7 R gives about 2,5 Amps into the coil. This gives a solide magnetic field in the coil but no voltage at the secondary side. 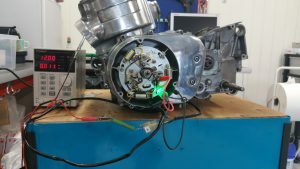 When the camshaft hit the circuit breaker and open up the points, the current are cutt off and the magnetic field collaps. This is the change in the field that gives the high voltage at the secondary side. 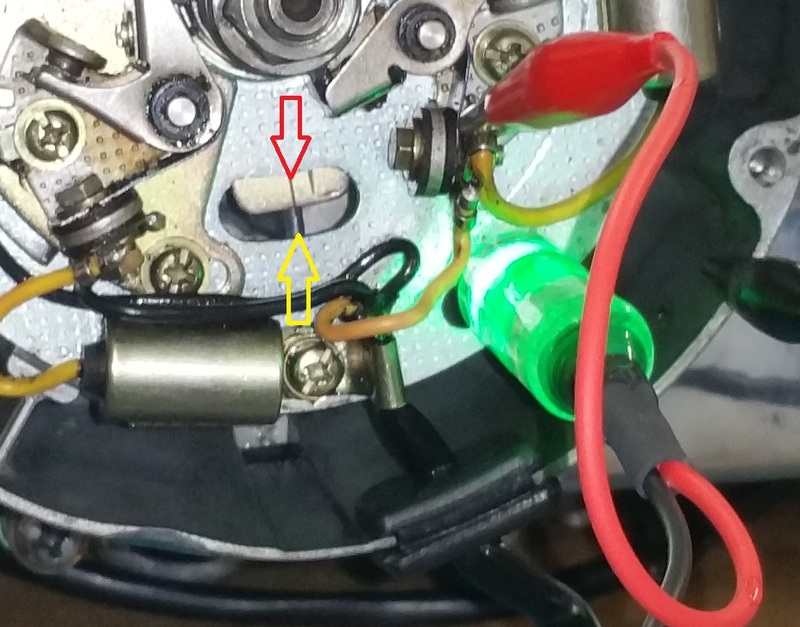 The voltage across the opened point is also very hig but the capacitor in paralell charge up and protect the points from getting worn. An easy access to all of the three coils is to measure from the side panel and to the positive pole on the battery cable. Remember the signal from the meter has to go through the emergency switch and the ignition switch. I found 4,7 ohm on all of the secondary side coils. The orange wire is the common wire for all of the coils. Measure from the orange one and to the White (Left coil ) Black /yellow ( Center coil ) and Black wire for the Right coil. 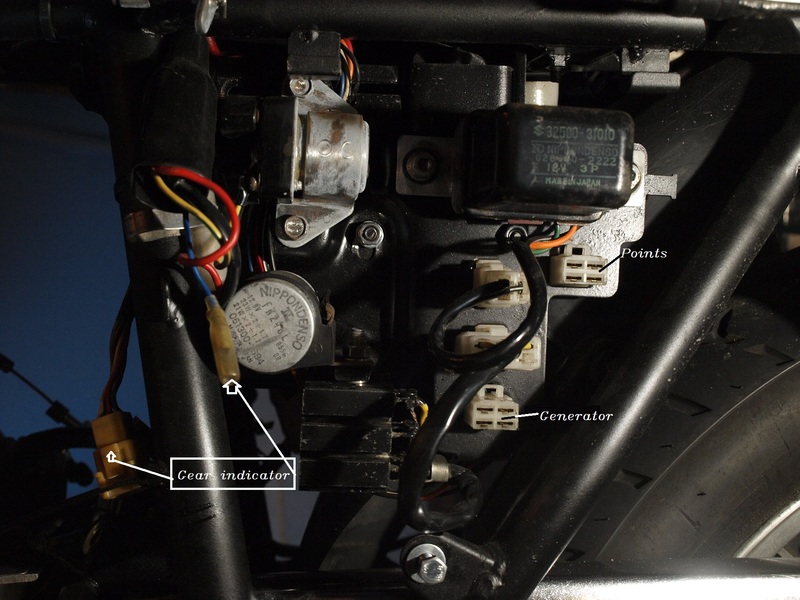 The schematics shows the circuitry to ignite all of the spark plugs. This is a copy from the Suzuki service manual. In the schematics all three points are drawn in a open position. This will never happen. The normal positon is closed and 24 deg before pistons top position (BTDC) the contact breaker (point) will open up if the adjustemen is done correct. Step 1: Contact breakes are closed. 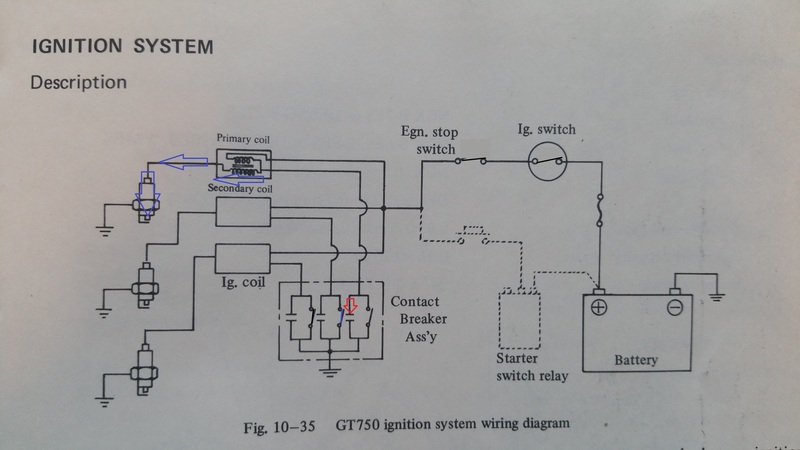 Ig.swich and Egn.stop switch must of course be in closed position to allow current to the coils. 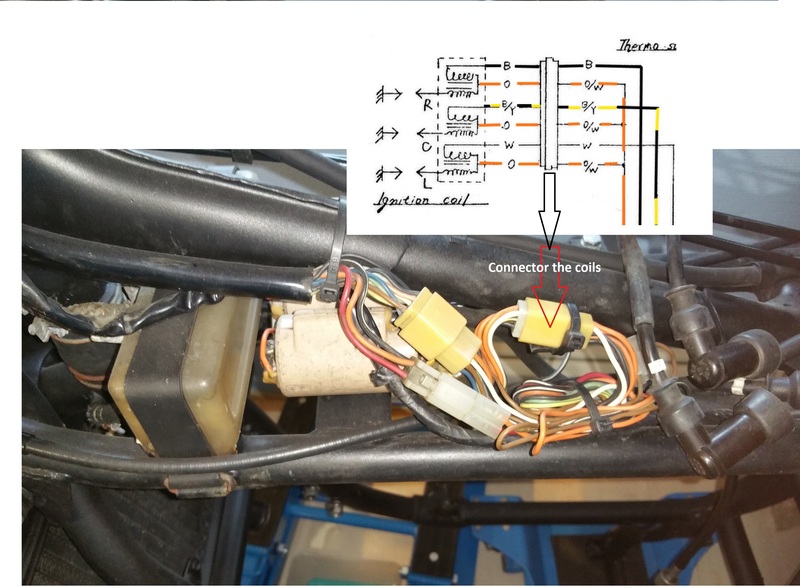 The red arrows in fig.2 shows how the current goes from the battery through the primary coil and down to ground through the contact breaker.The same will happen in the others coils as long as the corresponding contackt breaker is closed. This is the reason why you drain the battery empty quite soon if you leave the ignition switch on while parking. A lot of current are going through the coils. 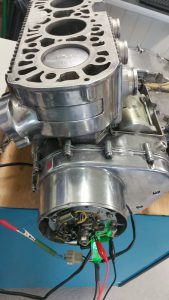 When the piston comes to the BTDC ( 24 deg before the top, 3,64mm on left and right cylinder and 3,42mm on the centre cylinder ) the contact braker open and cut off the current into the coil. The basic functions of coils and capacitors will be explained more in depth in a separete post. The physical implementation and the adjustment procedure for the timing will also be explained in a separate post.